Producing Braille at high speeds while maintaining quality is a demanding mechanical process which requires a heavy-duty, precision-made Braille printer in order to meet these rigorous demands. As opposed to personal use Braille printers, a production Braille printer is designed to not only emboss Braille quickly, but built for continuous operation – as in 15+ hours of use at a time, with the user only stopping to reload paper no more than once per hour (when using rolls, the user may only have to stop once per day). On the other hand, personal Braille printers are built to produce low quantities of Braille documents. They can be great machines for low volume Braille printing, however, due to their construction and paper handling methods, they are not suited to produce large volumes of Braille documents for businesses, schools or government entities. Hence, Braillo Braille printers are the preferred choice by nearly all major Braille production centers, because they are specifically built to handle the heavy demands of true Braille production. Production Braille printing is on a magnitude more demanding than consumer Braille printing. Manufacturer’s specifications aside, look at the quality of the Braille printer, its components and ask for real customer references. To demonstrate the differences between Braillo production Braille printers and those of its competitors, compare the mechanical parts. When critical parts such as these fail, Braille production stops. Looking at side-by-side comparisons of just a few of the parts below, which Braille printer would you trust to meet your Braille production requirements? Click on any image to enlarge it to see the obvious: Braillo is in a class of its own when it comes to production Braille printing. Production Braille printers need industrial level motors to meet the heavy demands of Braille production. Braillo uses a powerful main motor to operate the printing mechanisms, and then a separate, smaller motor to run the paper handling component. In contrast, the competition uses a single, small, lightweight stepper motor to run all of its operations. Braillo uses (2) timing wheels made of case-hardened steel and are significantly larger in size compared to the (1) tiny wheel made of lightweight aluminum used by the competition. 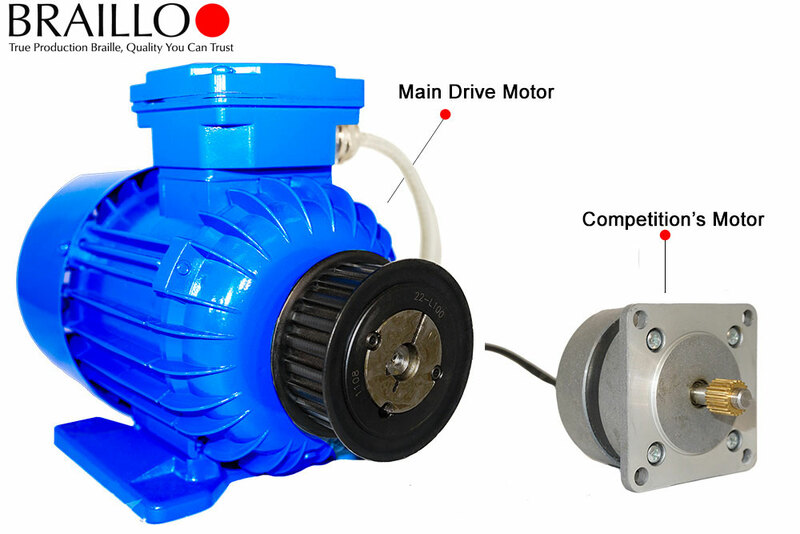 In partnership with both the timing and drive wheels, the main drive/timing belt controls the printing operations. In a Braillo, this main belt wraps around two sets of timing wheels and the main motor drive wheel. 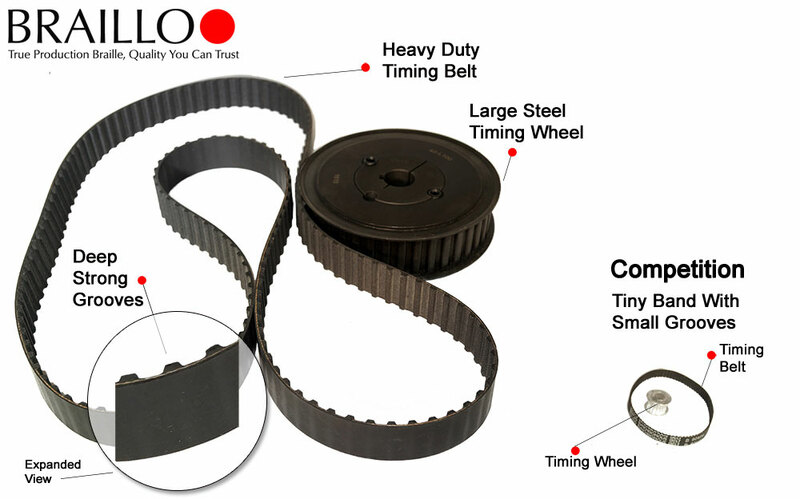 With high levels of torque necessary for high speed Braille production, the drive/timing belt must be strong and extremely durable for dependable operation. Braillo uses a strong, heavyweight belt made of thick flexible rubber which is highly durable. In comparison, the competition uses a lightweight rubber band. 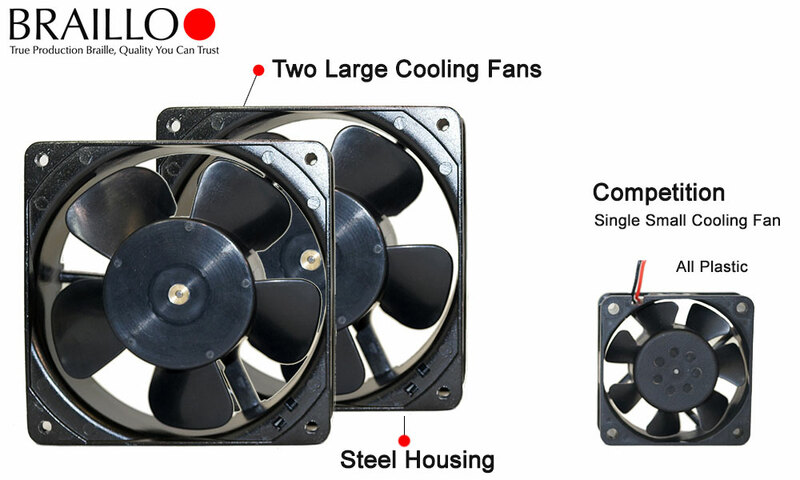 Braillo uses a thick, heavy-duty steel belt tensioner that provides constant and strong pressure, while the competitor uses a thin plastic tensioner susceptible to bending and breaking while under the lightest stress. Running a production printer for numerous hours each day causes heat build-up – something which can potentially harm electrical components, or cause the user to have to stop production and let the printer cool down. 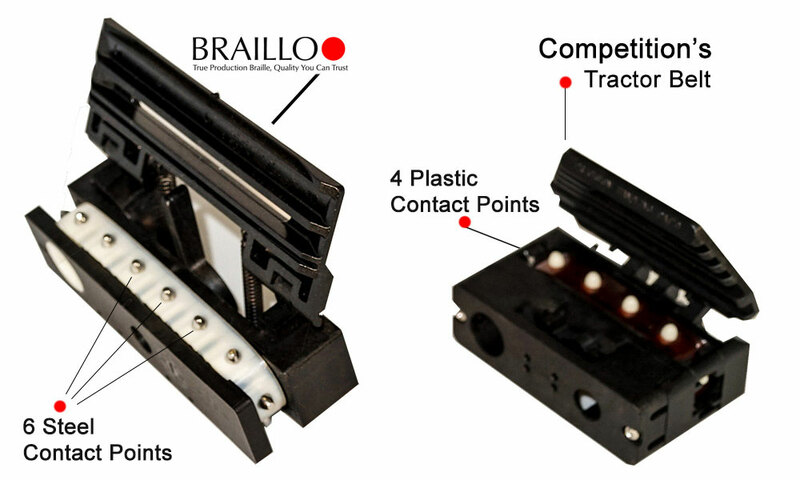 Braillo uses heavy-duty tractor feed units with 6 steel contact points and a durable belt mechanism, while the competition uses a thin plastic belt with just 4 small plastic contact points, making the paper susceptible to misalignment and tearing. Braillo Braille is known as the easiest to read and the reason is simple, our Braille is perfectly aligned and the dots are where they’re supposed to be. We meet government standards. When the Braille isn’t where it’s supposed to be, the reader has to try and guess what the word is, or stop and re-read the sentence. Braillo is the world’s leading and largest manufacturer of true production Braille printers. Braillo Braille printers are built to serve high volume Braille printing, starting with the Braillo 300 S2 and all the way up to large-scale, high speed Braille Book/magazine production of the Braillo 650 SF, which folds, adds a cover and staples a book/magazine. 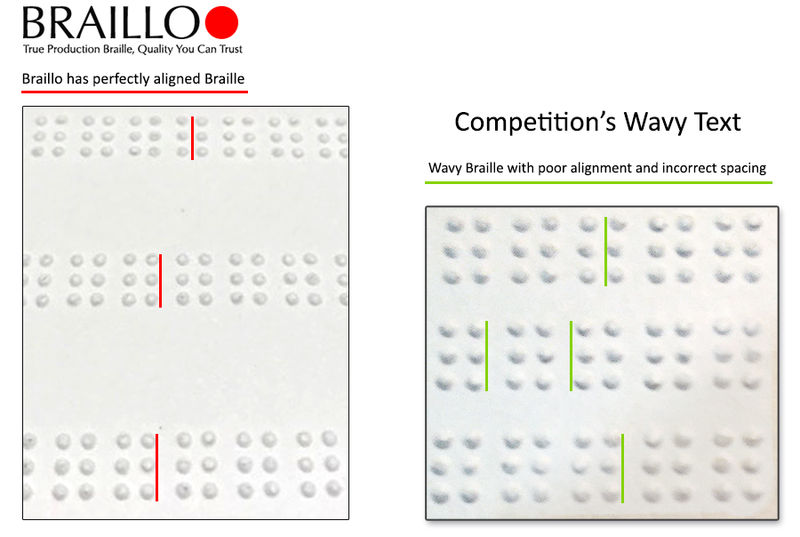 Braillo is often asked why their production Braille printers are heavier, larger and more expensive when compared to the lower-priced alternatives sold by its competitors. The answer is clear: Braillo builds heavy-duty, high quality, durable printers for true, large-scale Braille production. Braillo’s competitors assemble personal Braille printers with consumer-grade parts, and sell them as production Braille printers – there is just no comparison between the two. Initial acquisition cost does not equal total cost, and over a several year period, a Braillo printer is more cost-effective when you factor in downtime, repairs and replacement costs, all of which are associated with buying a lower-priced alternative.